How does acupuncture work? This ancient treatment delivers impressive results. Studies support the use of acupuncture to treat a variety of painful conditions. And your follow-up question most likely would be: “Does acupuncture work?” The good news is that studies support the use of acupuncture to treat a variety of painful conditions. Back pain is the most commonly reported use, followed by joint pain, neck pain, and headache. Acupuncture has also been proven effective for treatment of post-operative dental pain, carpal tunnel syndrome, fibromyalgia, menstrual cramps, osteoarthritis, and tennis elbow. Chronic back pain: A study released in 2009 in the Archives of Internal Medicine found that acupuncture was more effective at relieving chronic back pain than standard care such as medication and physical therapy. Migraine headaches: Researchers from Britain have found that compared with standard medical care, acupuncture offers substantial benefits in preventing headaches and improving the quality of life for people who suffer from migraines. Arthritis: A study published in the Annals of Internal Medicine showed that compared to anti-inflammatory drugs and physical therapy, acupuncture provided greater pain relief and improved function for people with osteoarthritis of the knee. How Does Acupuncture Work for Other Conditions? Besides relieving the conditions mentioned above, acupuncture has been proven effective for a variety of medical conditions: Infertility, allergies, smoking cessation, skin problems, digestive disorders, cataracts, insomnia, chronic fatigue, blood pressure regulation, Parkinson’s disease and even depression and anxiety. So… How Does Acupuncture Work? Back to our first question: How does acupuncture work? There isn’t a single scientific theory that collaboratively explains all of the physiological mechanisms underlying the effects of acupuncture. It has been proposed that acupuncture primarily produces its effects through regulating the nervous system. It aids in the activity of pain-killing endorphins and immune system cells at specific sites in the body. In addition, studies have shown that acupuncture may alter brain chemistry by changing the release of neurotransmitters that affect the parts of the central nervous system related to sensation and certain functions that regulate a person’s blood pressure, blood flow, and body temperature. Some of the physiological effects of acupuncture observed throughout the body include increased circulation, decreased inflammation, relief from pain, relief of muscle spasms and increased T-cell count which stimulates the immune system. There are a variety of acupuncture techniques, but those that have been most often studied involve penetrating the skin with hair-thin, solid, metallic needles that are manipulated by the hands or by electrical stimulation. 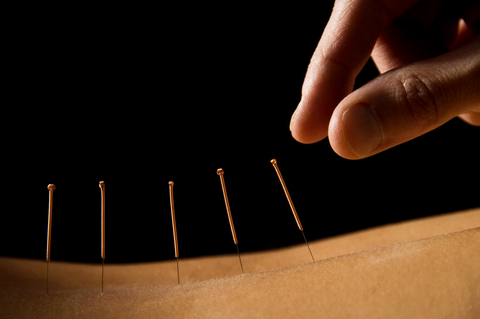 While people experience acupuncture differently, most feel no or minimal pain as the needles are inserted. Improper needle placement, movement of the patient, or a defect in a needle can cause soreness and pain during treatment, which is why it is important to seek acupuncture treatment only from a qualified practitioner. Make sure you seek treatment from a qualified practitioner who is trained and specializes in acupuncture. Many chiropractors and naturopathic physicians offer this treatment. Give it time. Acupuncture is not a one-time treatment. It usually takes six to 12 sessions before noticing improvement with pain or other chronic health conditions. Depending on the diagnosis and duration of symptoms, more treatments may be required. Treatments generally begin at an occurrence of three to four times per week and gradually decrease to weekly or bi-weekly sessions. Be sure to incorporate other alternative therapies simultaneously with your acupuncture treatment. While acupuncture will address the symptoms of your condition, it may not fix the underlying root cause. So does acupuncture work for you? If you have utilized it for your chronic pain or another medical condition, we would love for you to share your experience in the Comments section below. By doing so, you may be able to encourage others to try this approach for their chronic pain. National Center for Complementary and Alternative Medicine from the National Institutes of Health. Vickers AJ, Rees RW, Zollman CE, et al. Acupuncture for chronic headache in primary care: large, pragmatic, randomized trial. British Medical Journal Online First; doi:10.1136/bmj.38029.421863.EB. Published March 15, 2004. Scharf HP, Mansmann U, Streitberger K, Witte S, Krämer J, Maier C, Trampisch HJ, Victor N. Acupuncture and knee osteoarthritis: a three-armed randomized trial. Annals of Internal Medicine . 2006 Jul 4;145(1):12-20. The University of Chicago Medicine. This blog was originally published in 2012 and is regularly updated. acupuncture for, acupuncture treatment, acupuncture treatments, allergies, alternative medicine, anti inflammatory, anti inflammatory drugs, anxiety, arthritis, back pain, blood pressure, brain, cataracts, central nervous system, chronic back pain, chronic fatigue, chronic low back pain, chronic pain, complementary and alternative medicine, cramps, dental pain, depression, depression and anxiety, digestive, digestive disorders, does acupuncture work, endorphins, fibromyalgia, headaches, health, how does acupuncture work, immune system, infertility, inflammation, insomnia 2, joint pain, knee osteoarthritis, low back pain, medical conditions, menstrual cramps, migraine, migraine headaches, migraines, muscle, muscle spasms, naturopathic, neck pain, neck pain and headache, osteoarthritis, pain, pain pills, pain relief, parkinson s disease, skin, smoking, tennis elbow. I went through acupuncture treatment for whiplash and lower back pain. It worked very successfully, better than all the pt I had been through. I’m a believer. After trying a variety of OTC pills and creams for arthritis in my hand, I asked my chiropractor to treat the area with acupuncture. Much to my amazement, relief was almost immediate. The first few treatments removed the pain for the entire 3 weeks we were away on a cruise. Now I have maintenance treatments every 2 weeks and seldom need to think about my hand! After being failed by Western medicine, I sought out alternative ways to manage my pain. Acupuncture was one of those methods I chose to try. I suffer from rheumatoid arthritis, fibro, sciatica, and low back pain. After the first acupuncture treatment, I walked out amazed because my pain was greatly reduced. Its now been 2 months since I began treatments (2X/week)- and not only has my pain substantially decreased, my moods and emotional state have been affected in a positive way. I HIGHLY recommend acupuncture as one way of helping yourself. I thought you might be interested in this article on https://universityhealthnews.com: How Does Acupuncture Work?